Whether you’re looking to take your basketball game to a whole new level, or just starting out with the game, there are few things that can make as dramatic a difference as a finding the right pair of shoes. After all, basketball is a game of being quick on your feet for lateral movements combined with running up to several miles back and forth across the court! Having an extra spring in your step can be the factor that helps you to get in position for the shot and that keeps your legs feeling fresh late in the game. In addition, finding the right pair of shoes can be critical for avoiding injury – a lateral juke can quickly turn into a slip if your shoes lack traction or a sprained ankle if they don’t provide adequate support. Nearly all of the major athletic footwear companies make basketball shoes, so it can be overwhelming to find the pair that is right for your game – especially if you’re new to basketball. To make the choice easier, we’ve put together a list of the seven best outdoor basketball shoes for women. Indoor vs. Outdoor Basketball Shoes: What Is the Difference? Favor bounce or shock absorption? Breathability, or a shoe that lasts? The best basketball shoes have many design features in common, regardless of whether they’re for indoor or outdoor games – after all, the demands on the footwear with respect to quick lateral movements are similar. But there are important differences, and none is more important than the changes to the sole. Outdoor basketball shoes feature a much thicker and harder rubber sole than their indoor counterparts, which also makes them significantly heavier. Whereas the surface of indoor basketball courts is typically polished wood, outdoor basketball courts are often asphalt, concrete, or, for newer courts, acrylic. Asphalt and concrete are hard surfaces that can cause wear on your joints after years of playing basketball outside, and one of the advantages of the thicker sole of outdoor basketball shoes is that it provides more shock absorption every time your foot hits the pavement. In addition, the thicker sole makes the shoe more durable against outdoor surfaces, which are rougher than polished wood. Another common change to the soles of outdoor basketball shoes is to add patterns in the rubber, such as deep grooves, that increase their traction. This reduces slipping, especially when the court is wet from recent rain. One other feature that commonly varies between indoor and outdoor basketball shoes is the ventilation built into the shoe. Whereas indoor courts are often temperature controlled, summer games outdoors can be swelteringly hot – especially for your feet when you’re running hard in the middle of a game. Outdoor shoes often feature mesh panels to add ventilation so that your feet stay dry inside the shoes. There are a couple key features to look for in basketball shoes in general, and outdoor basketball shoes in particular. One of the most important things in a pair of shoes is how much stability the shoes offer during sudden accelerations and decelerations. This comes down to several design factors. The first is shoe width. The best basketball shoes incorporate an extra wide base to help keep your center of gravity over your feet, but also aren’t so wide as to inhibit sideways movements. The second factor is the ankle cuff design. Most basketball shoes feature high ankle coverage designed with a stiff material, to protect your ankles from rolling sideways during quick lateral movements or slips. This adds weight to the shoe and can cause discomfort for some people, especially if the ankle cuff is not well-padded, so it’s important to weigh your risk for ankle injuries against your desire to move quickly and comfortably. Lastly, traction is an essential component to basketball shoes. Look for shoes that feature tried-and-true traction designs in the sole, such as the “herringbone” design that many manufacturers have adopted because of its effectiveness during lateral movements on slick surfaces. Another important component of basketball shoes that should weigh in your decision is the springiness of the midsole. Different shoes use different midsole materials, some of which are extremely firm and others of which are soft and cushioning. The difference is that firm midsoles are highly responsive, and can provide an increase in agility on the court. However, because of this spring, they do a poor job of dampening vibrations and can lead to aching in your feet or legs by the end of a long game. Softer midsoles are better at shock absorption, but also won’t bounce off the ground as quickly when you’re looking to make a fast break. A final consideration is the outer material of the shoe, which affects shoes’ breathability and durability. Materials like synthetic mesh are excellent for breathability, but not particularly durable or good at providing stability since it flexes easily. Leather, on the other hand, is highly durable and stiff, but not very breathable. In addition, leather requires a break-in period that synthetic materials do not, but many people find that leather fits more snugly and comfortably than synthetics after it is worn in. Deciding among these various factors comes down to personal preferences and the temperatures you expect to play in. Under Armour’s Jet shoes were designed with the perfect fit and comfort in mind. The shoe is made primarily of lightweight leather, which during a short break-in period conforms perfectly to the shape of your foot. 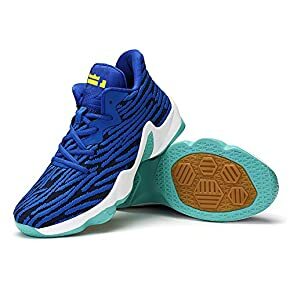 In addition, the interior of the shoe features a compression-molded foam midsole that adds significantly to the vibration dampening of the shoe against hard concrete outdoor courts. The Jet also feels great against your foot and leaves no interior seams exposed to generate friction thanks to a full-length, custom-molded liner. When making quick lateral movements, the Jet performs well. The sole is designed with a multi-directional traction pattern in the rubber that holds fast no matter which way you accelerate, and the stiffness of the leather outer material helps to prevent your foot from rolling within the shoe. In addition, the high ankle padding is both luxuriously soft and provides solid support against sprains. Where the Jet falls short of other basketball shoes is venting heat. The upper material is a breathable synthetic mesh, but since the bulk of the outer material is leather the shoe can get toasty on hot days outside. The Hyperdunk shoe features Nike’s latest innovation, React foam, to add a serious spring to your step and your game. The foam is extremely firm, giving the shoe a faster rebound when it hits the ground compared to traditional midsoles molded out of EVA. That means in turn that you can move with more agility on the court. 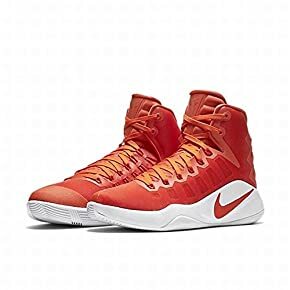 However, be careful transitioning to the Hyperdunk from softer shoes – some people have found that the firm midsole doesn’t provide enough cushioning and leaves their legs aching by the end of a long game. Nike also made a change to the shoe’s outer material that can spark different opinions among users. The outer material is a breathable synthetic, but instead of just using one layer of mesh Nike added a layer of nylon backing. That makes the shoe more durable than mesh-only shoes, but also makes them less noticeably less breathable – although still better than the leather material used in the Under Armour Jet. In terms of stability, the Hyperdunk excels. The sole features a “herringbone” style traction pad that prevents it from slipping on even the slickest of courts, and the shoe was designed to provide an extra wide base that makes it easy to stay on your feet while taking advantage of the quick movements afforded by the React foam core. The Pro Model Zero’s distinguishing feature is that it features an all-leather exterior. That makes the shoe extremely durable on the court compared to competing shoes with synthetic components, but it also means a longer break-in time before the shoes will feel snug and comfortable against your feet. In addition, the toe box is covered in a rubber overlay – which can go a long way to saving your toes if someone steps on your foot during the game as well as extends the life of the shoes. However, the cost to all of this exterior protection is that the shoe suffers in breathability, so it may not be the best option for mid-summer games. The Pro Model Zero provides comfortable support, but the designers didn’t go out of their way to add comfort-driven features. The ankle cuff in particular is stiff and lightweight, but not doesn’t provide a soft cushion against your upper ankle. The midsole features Adidas’s long-lived Torsion System arch support, which enables the fore- and rear-foot to move independently and in doing so adds significant stability to lateral movements during a game. The rubber sole also helps with this stability, as the molded pattern provides multi-directional stability against slippage. 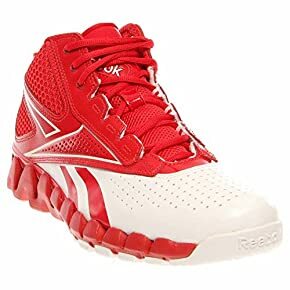 What sets Reebok’s basketball shoes apart is the inclusion of their Zig technology in the midsole, a zig-zag shaped foam that is designed to reduce energy transfer through your foot upon impact with the court. That means that by the end of a long game, your legs won’t feel as tired because you haven’t had to deal with as much vibration from hitting the ground. And in the long run, your joints will surely thank you for taking a diminished beating. The Zig design also adds spring to the shoe which, like for Nike’s React foam, can help you to be more agile in your movements on the court. 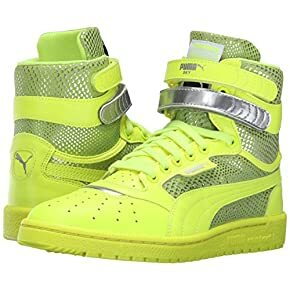 The shoe is also comfortable and durable thanks to using primarily leather for the outside construction, with the exception of a synthetic mesh in the upper to improve breathability. Breathability is also improved by cutting the ankle off at a lower point than for most other basketball shoes. This also makes the shoe lighter, which on the court translates to faster and less energy-consuming over a long game. However, that comes with a serious compromise in stability and support, since the shoe does not keep your ankles stiffly aligned over your foot. Although the rubber sole increases the shoe’s stability thanks to the patterned rubber design, the lack of ankle support can be a deal-breaker for players who are concerned about ankle injuries on the court. Ankle support is always a serious consideration for basketball shoes, but the Sky II HI shoes take ankle protection to a whole new level. The ankle shaft of the shoe is not only high, but cinches down snugly thanks to two narrow Velcro straps dedicated to tightening the ankle shaft against the lower portion of your shin. That means you don’t have to worry about overtightening the laces to ensure ankle stability – and ensure that if your ankle rolls, your leg is rolling with it so that it won’t sprain. The Sky II HI doesn’t perform nearly as well under your foot as competing shoes, however. The midsole is relatively thin and does not feature a well-tested foam technology or innovative design like offerings from Nike or Reebok. 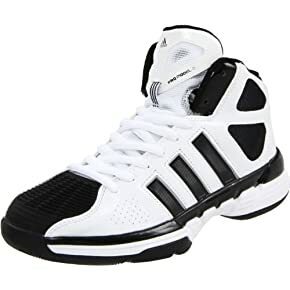 The result is that the shoe is not particularly responsive against the court, nor does it do a standout job of dampening vibrations against your foot – both of which may turn away more serious players looking for agility and comfort throughout a long and grueling game. Another shortcoming is that although the shoe uses high-quality leather for the exterior, it uses a bit too much for many players’ tastes. Even the upper is leather, drastically reducing the shoe’s breathability for hot outdoor games. Where competing shoes chose leather for its durability and snug comfort, the Town Couple went for synthetic fabrics to enhance breathability and reduce weight. The shoes even took this drive for breathability one step further by incorporating Flyknit fabric, a synthetic material specifically designed for its ability to move hot air and moisture, into the upper. The result is a fast shoe that won’t heat up your feet even on extremely warm days under the sun. However, the lightweight design also comes with some significant trade-offs. For example, the all-synthetic exterior is not as supportive or as comfortable as leather and can cause rolling and friction during quick lateral movements. In addition, the shoe is similar to Reebok’s Zig Pro Future in that it lacks a true ankle support, instead opting for a low-cut design. While that might be more comfortable for some players, for many the lack of ankle support in basketball shoes is tempting a sprain on the court. The chances of such a sprain increase thanks to the poor sole design, as well. The rubber sole is patterned, but the designers do not appear to have learned from the success of Nike’s “herringbone” sole and the shoe is prone to slipping during fast lateral movements. The Micro G Torch isn’t the lightest basketball shoe out there, but thanks to its combination of springy cushioning and support, it’ll have you moving fast up and down the court. The Micro G Torch features Micro G foam, a direct competitor to Nike’s firm and springy React foam, throughout the midsole. While the same cautions apply – some people prefer a softer midsole – this midsole is great for adding a spring to your steps. The next key in the shoe’s speed is its support around the ankle. The mid-height ankle cuff doesn’t overdo ankle protection, but it does provide enough coverage to give you confidence that your ankle won’t budge during lateral motions. In addition, the outer material of the shoe, including the upper, is all leather. That keeps the shoe comfortably snug against your foot and provides stiff resistance when your feet try to break out of the shoe’s platform area. Finally, the “herringbone” pattern on the sole means that you won’t slip – period. The only downside to the Micro G Torch is that because the shoes are entirely leather, breathability is severely limited. 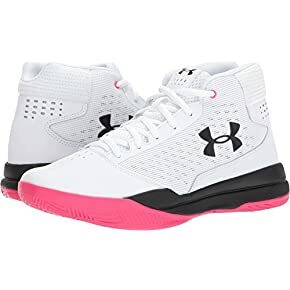 Under Armour did alleviate this slightly by including perforations in the forefoot and heel, but the air transfer those provide will be minimal on a hot day. Having the right pair of shoes – one that gives you the just the right amount of spring in your step while balancing fatigue and providing steadfast traction on the court – can make all the difference in your game. 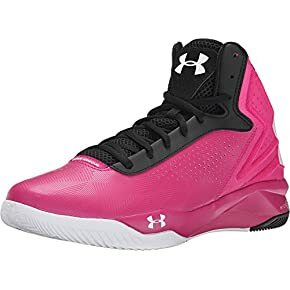 With this list of the best outdoor basketball shoes for women, you now know what features to look and which shoes can deliver the goods. So grab a new set of kicks and take your basketball prowess to a whole new level this summer.